At first glance, GroBoto 2.3.3 looks like it might be just another 3-D modeler—until you launch it. Then you discover an entirely different process for creating 3-D models and scenes that actually forces you to think creatively and organically. It’s fun and addictive, almost game-like. It isn’t until you’ve spent several hours playing with GroBoto that you realize you might actually have several uses for the models you created, say in art projects and motion graphics production. Unfortunately, that’s when you find yourself wanting more than GroBoto can deliver. 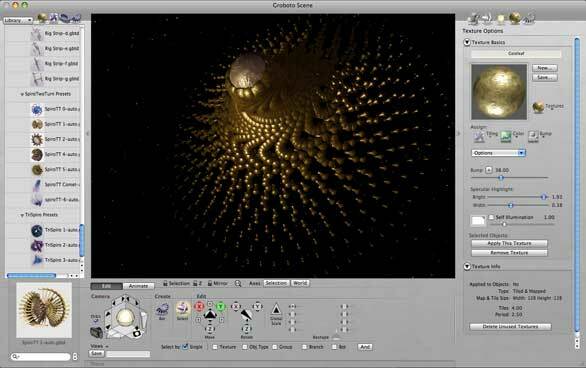 GroBoto (developed by Braid Art Labs, but distributed by Smith Micro) is a 3-D modeler and renderer of unique, true-geometry objects (as opposed to splines and polygons) and shapes that utilizes a so-called robo-organic method. With this technology, the models literally grow with the movement of the mouse, creating fractal-like, sci-fi structures and images. The program is for anyone who wants to play with 3-D imagery to create cool objects and scenes, or artists, illustrators, or animators who want to expand their creative horizons. There are several ways to create models (called Bots) in GroBoto. Many of the models are generated as preset components that you build or expand on. You don’t just click to add a shape, but rather click and drag to organically build and expand the elements around your model. This is both fun and frustrating, as you don’t have complete control over the output and you will rarely be able to create the same model twice—unless you really learn how to control this application’s individual Bot elements. You aren’t limited to the automated modeling features, however. You can modify and apply many primitive shapes and sub-Bot elements to your model as individual components. As intuitive as GroBoto may first appear, it presents a difficult learning curve when it comes to modeling and texture editing, and the documentation doesn’t explain things well. Many of the tools are not logical and don’t work as you might expect. As with Bryce back in the mid-1990s, you are probably better off not having any prior 3-D application experience, as that will most likely just further confuse you when navigating GroBoto. For example, the method of controlling the orientation and positioning of models, lights, and camera angles is very different from that of most other 3-D applications. But once you understand how the tools work, they are actually quite intuitive. Unfortunately, GroBoto only allows you to export an OBJ format 3-D file, so none of your textures get exported with the model. This is a shame, as GroBoto’s texture editor is exceptional. Though many applications can import OBJ files, in many cases you’ll lose the individual Bot objects and textures, as the file will import as one complete model object. Modifying or creating new textures is perhaps the most intuitive process in GroBoto. The features are well labeled and logical. You can create your own textures or modify existing ones to meet your needs and save them in your User’s texture library. The only thing lacking is adequate transparency, refraction, and glow controls, but that’s a minor inconvenience. I also wanted the ability to composite an external image for my background. While GroBoto does not support that function, it does allow you to render your model with an alpha channel for use in other applications such as Adobe Photoshop. You can also add TIFF images to your GroBoto Maps folder for use as color or bump maps without having to restart the application. The creative process for making cool sci-fi models and scenes in GroBoto can be fun and addictive. The lack of basic animation tools is GroBoto’s most frustrating shortcoming. The only animations you can create are based on changes to keyframe stages on AutoBots and in the Morph Settings panel. This is a very difficult process to grasp and doesn’t allow you any real control over the animation, other than the stages of morphing to the AutoBot. It doesn’t work with all Bot types (not even with all AutoBots), and you have to plan ahead if you want to use this feature in your project. The multiple keyframes you might create with the morphing AutoBots are not very smooth, and there’s no ease of control because the process isn’t timeline based. It’s very difficult to figure out on your own how to get the Morph animations to work, but after a lot of reading and research I was able to get one to function for me. This is by far the most nonintuitive part of the program. I truly hope the developers will add some simple camera animation in future versions of GroBoto that won’t require morphing transitions to create a simple animation. I did manage to export some models I had created and open them in Photoshop CS4 as 3-D layers. I could then create new surface and bump textures and animate their position and lighting at will--creating some amazing animations, including some stereoscopic 3-D ones (you can view samples on my blog site). A separate desktop player from GroBoto’s Web site called the GroMobile Player showcases little animated games called Gizmos. Only GroBoto’s Mac version (2.2.1 or later) works with the tools to create the Gizmos you can download with the instructions and sample tutorial projects from the GroMobile site located here: http://www.groboto.com/gromobile_tutorial.html. I honestly haven’t had so much fun exploring in a 3-D environment since the early Bryce days. The GroBoto developers are on to something amazing here. No other 3-D modeling software on the market today can match what GroBoto 2.3.3 does. GroBoto has a simple and intuitive side that will have you creating models and images quickly, but to really understand the modeling and texture editors, you must overcome a bit of a learning curve and vague documentation. Also, the fact that you can’t animate and use your creations outside the GroBoto environment left me frustrated and wanting more. If future versions of GroBoto allow a greater choice of model export options (including textures and bump maps), as well as an animated camera or two, I can envision a lot more GroBoto use in mainstream motion graphics production and animation.